Huh? Did I miss something? Does becoming an elected official automatically bestow extra Constitutional powers to our incumbent politicians? Because that is what Mouet is saying. Free speech is apparently available in Santa Ana but only if you were fortunate enough to win an election. Free speech is not extended to anyone else! Is this what we expected from our all-Democrat Santa Ana City Council? Does this mean the “Santa Ana Spring” is dead? 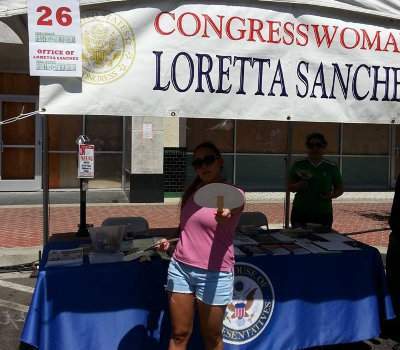 That hypocritical approach was abundantly present in Downtown Santa Ana today as friends of mine reported that U.S. Representative Loretta Sanchez was there, and her staff was at a booth. Mouet specifically mentioned her by name today. So she can have free speech because she is an elected official but the Measure CC campaign, as we reported yesterday, was told they could not have a booth because, well, that is political. But Sanchez somehow isn’t political? What??? 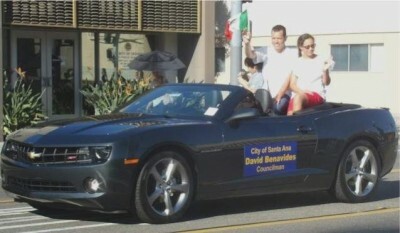 Councilman David Benavides in the Fiestas Patrias Parade? The City of Santa Ana says that’s not political! Tomorrow Sanchez and other elected officials will be walking and driving through the Fiestas Patrias parade, which starts at 4 pm. But no other challengers or ballot measures will be allowed to participate, for no good reason! Just because that is how Mouet and company roll. This is all completely unconstitutional! I hope the ACLU sues the City of Santa Ana. They have done so before and won. Time for another lawsuit! You should know by the way that the Fiestas Patrias is all about celebrating Mexican independence. How ironic that our city leaders are using this opportunity to squelch freedom in Santa Ana. 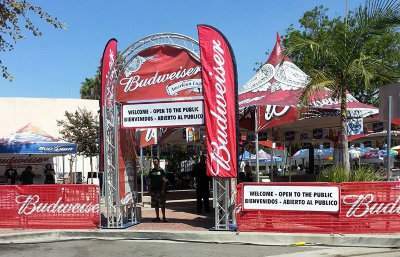 It is by the way laughable that the City of Santa Ana is providing a beer garden at the Fiestas Patrias. Don’t they know that alcohol consumption leads to DUIs and to domestic violence? You cannot say that about marijuana! But informing the voters about Measure CC? No! Not in Santa Ana. That’s political. Well folks we live in a city that is starving for information about the candidates and measures on the ballot in November. Unfortunately our city administration doesn’t extend free speech courtesies to anyone that hasn’t already won an election. And that is just not right. Don’t attack the beer garden editor. That is not relevant. And would you rather that they pay more for a beer at the hipster restaurant across the street? I’d rather they allow free speech and approve legal dispensaries. Define, ‘hipster’. What restaurant across the street? We know you two, (editor and yourself), love to play online ping-pong with your hate for the downtown. It’s really an old subject. Nobody has stopped going downtown and eating at the restaurants. More restaurants are in the works. Nothing has come to a halt, been slowed down or changed course because of this blog. I guess this blog is an anti-downtown virtual sewing circle. Idea-just share your booze and pot between the two of you and your covered. You won’t even need a reservation or deal with figuring out how much to tip. About 10 to 15 cop cars stopped a Cadillac, guns drawn, order the people out one at a time just like on the show “cops” They had one young man get out and then the driver, a woman, the cops told her to take the baby in the back with her and to open the rear gate door. Seems there was another but that person must have jumped out elsewhere. What kind of mother takes her baby with her on a crime? Ooooh. That sounds like the highlight of the day. Sorry I missed that one cook. It appears to be a mistaken ID. After scaring the crap out of the people the cops cut them loose. Now that is going to be a summer memory. It appears to be mistaken identity………..I was gonna say, the might have just participated in another anomaly! Kind of like the u.s. government doing whatever they want and making whatever lies they want for its war and petro industries. This is what politicians do in Third World countries. They protect the corrupt status quo and are afraid of candidates that may have better ideas or solutions in fixing the existing problems in the city. Is the city of Santa Ana fast becoming a third world city? I talk to Miguel at most every 3 to 5 weeks.